Well the 2013 Surratt Conference has come and gone and what a tremendous event it was! I’m happily exhausted after such a wonderful weekend socializing and listening to the most knowledgable group of people in the field of the Lincoln assassination. This was a very special conference for me as I had the honor of presenting about the Garrett family in front of my friends and colleagues. My speech was graciously received and I was overwhelmed by the kind words extended to me regarding it. I feel so fortunate to be part of such a supportive and collaborative field of scholars. 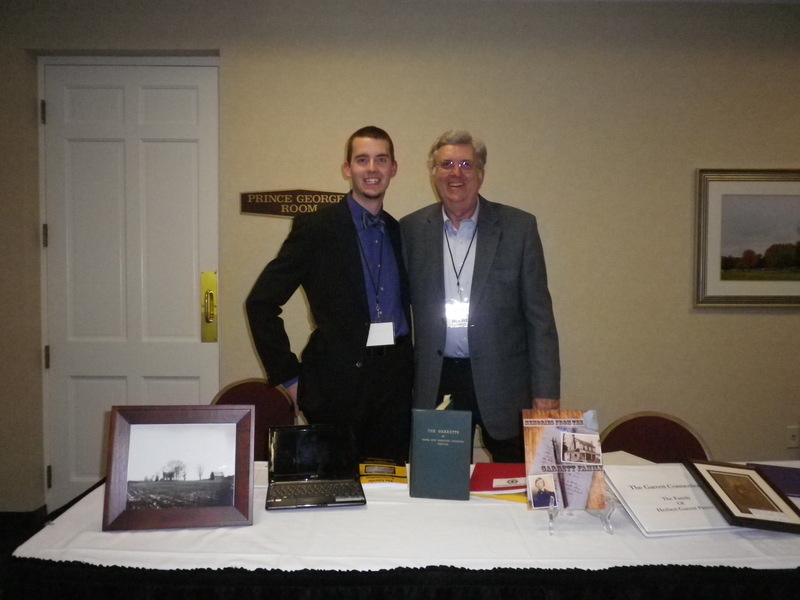 What really made the whole weekend special for me was that a descendant of the Garrett family, with whom I’ve been in contact with and visited a few months back, was able to attend the conference. 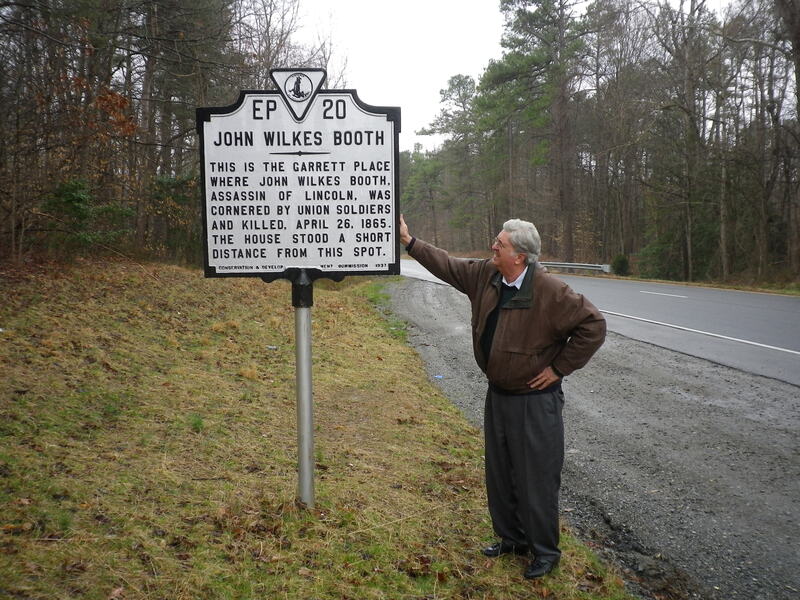 Today, I took him into Virginia to visit the site of the Garrett house and the church where the Garretts attended. It really was the most fitting way to end one of the best weekends of my life. Attached are a few pictures of this weekend, and I only wish I took more. Thanks for the recent post – the photograph of you and Judge Richard Hughes did come out rather well, if I do say so; but I have always regarded myself as a good/better-than-average photographer over the years. As I remarked: one of these days I will scan/convert all the JWB-escape route and other relevant photos that I have here from 35mm slide format to digital so that these can be shared around. But you are welcome – as I also said – to stop by here at any time to see these and my other/additional files. Regarding the telephone number here: 301-274-9610 – call, hang up on the taped message, and then call back a second time for me to answer the call. This gives me time to get to the phone and also – somewhat – screens out some of the junk calls. Calling here is good anytime until midnight. 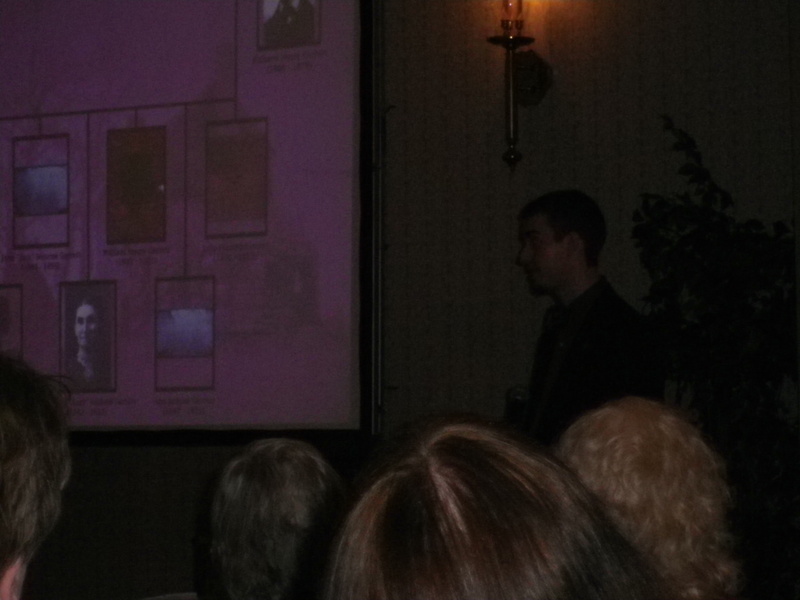 Regards – and thanks for presenting the superb, very informative, and very well-delivered Garrett family presentation. Thanks for playing photographer, Bob, and for the compliments. Keep up the good work at Bryantown Tavern. Dave, you did an absolutely awesome job. Your expertise, professionalism and enthusiasm showed. Missed the sock puppets. Thank you, Jim. I can’t wait to hear you speak one day so I can bring my laser pointer. Your presentation was so entertaining and chock full of new research you were kind enough to share. Thanks. Thank you, Kathy. I can’t wait to hear more about your research as it progresses. Hi Dave, thank you for inviting Judge Hughes to the conference. He graciously went through his photo album page by page explaining who everyone was. And oh, by the way, great presentation. You talked about and showed stuff that had not been seen before. I try to take after you and Jim, Rich. You two are practically digging up new people and facts in the assassination and I’m trying my best to keep up. Keep it up, dynamic duo! My speech was about the Garrett family of Caroline County, VA and some of their experiences with their temporary guest, John Wilkes Booth. 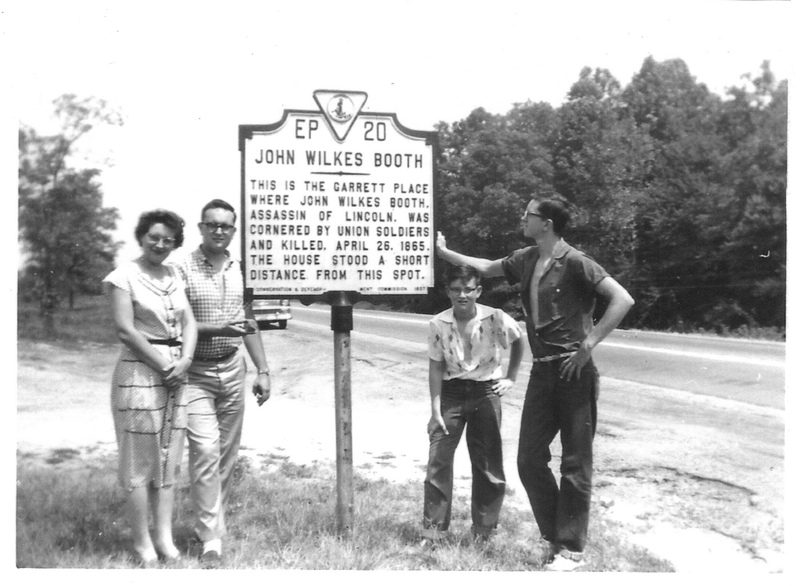 I gave a brief history of the family before Booth arrived, some little stories of their experiences with him, and the aftermath of his visit on their lives. I was so thrilled to be in such wonderful company. I really appreciate all the research that goes into all the excellent information that was made available to us. Dave, your presentation was fantastic. Thank you to everyone involved. And you were wonderful at the Mudd house, Donna, as I’m sure you always are. I’m so glad to have met you and that you’re part of “the gang” of assassination nuts like me. Great research and writing! As a part of the Garrett family myself it is always fun to learn new things about the family. 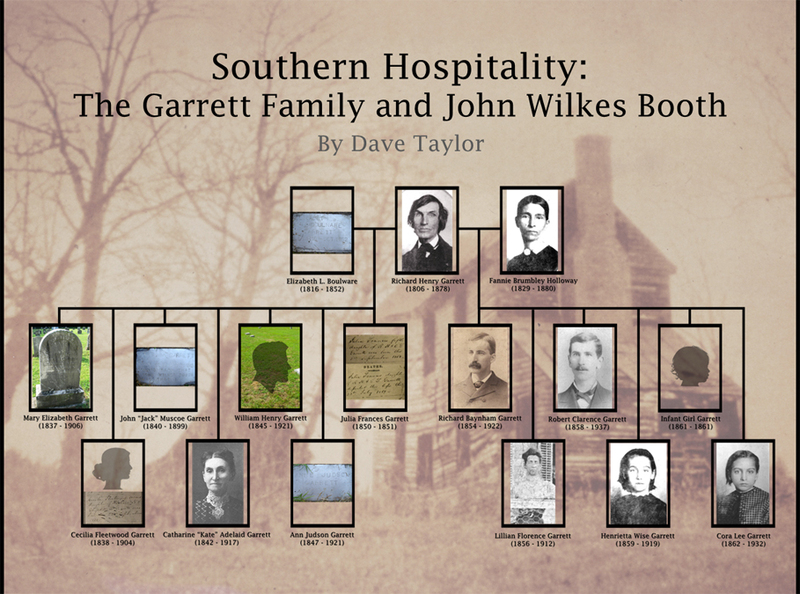 I saw that you have already seen the Garrett family history book which is the only thing my family still has, although we used to have an old newspaper article that we lost a couple years ago that had some interesting information.